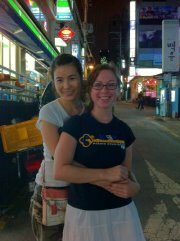 If you are looking to escape this country to teach English abroad, Korea is definitely worth considering. Korea offers some of the more stable TEFL contracts around to native English speaking graduates, including round-trip airfare and paid accommodation. There are also plenty reputable recruitment agencies enabling you to fix up something secure in advance. 1) What are your first impressions of Korea, Anne? What is the first thing you notice? What’s the part you have found most challenging? My first impression of Korea is that it is so different from what I’m used to back in the United States. To the writing on the buildings, to the neon on every single building, to the faces walking by–nothing is familiar. It’s all new and exciting. The first thing I notice is that there are more people packed into a much smaller space than I’m used to. Real estate is at a premium, so nearly all the buildings have businesses occupying them; the most challenging part is being stared at by everyone. I’m in a smaller town and they aren’t used to foreigners, plus I do kind of stand out with my lighter hair and eyes. 2) Where are you working and how did you find your job? I found it through a recruiting company; OK Recruiting. My recruiter, a woman named Bonnie, was a fantastic help through the whole process. I interviewed with three schools (through her company) and received job offers from them all; I picked my favourite and here I am. 3) Has your TESOL qualification helped you finding work and in the classroom? If so, how? My TESOL qualification was definitely a big help in getting a job. It fleshed out my resume since I don’t have any previous classroom experience teaching English. In the class, it has helped some, but on-the-job training really can’t be beat. 4) How do you find your students? What is the biggest challenge in your teaching and where have you already seen success? With a few exceptions, my students have all been wonderful. There are always some kids that have no interest in being there, whose parents are forcing them, but they challenge me to really work and draw them out in class. The most truculent students thus far are the teenagers. With them, the surest method is to be patient, take none of it personally, and try and make the lessons as relatable to pop culture as possible. My greatest success lies with those students who are around ages 11 and 12. They retain the enthusiasm of their youth but they are much more capable of understanding and being understood when they speak English, which really knocks down some barriers. 5) If there is one piece of advice you could give to someone coming to Korea to teach, what would it be? Everyone says you don’t need to, but for heaven’s sake: make some attempt to learn the language. If nothing else, learn how to say hello, do you speak English, thank you and goodbye. Koreans are incredibly forgiving when it comes to foreigners not speaking their language but that first attempt always makes them smile and gets them talking. Classroom phrases shouldn’t be necessary (all the students should understand simple commands such as “repeat,” “sit down,” and “write”) but it might not hurt. Above all: speak slowly.